It is starting to sound more and more likely that the rest of the country will get an insider’s look at the Cleveland Browns as Cleveland’s undisputed No. 1 team is reportedly HBO’s top choice for this summer’s edition of Hard Knocks. Well, ain’t that going to be a party? The ongoing quarterback situation, which will feature Josh McCown, Johnny Manziel and (just maybe) Marcus Mariota. Alex Mack’s return from injury. Justin Gilbert’s (hopeful) growth in the secondary. 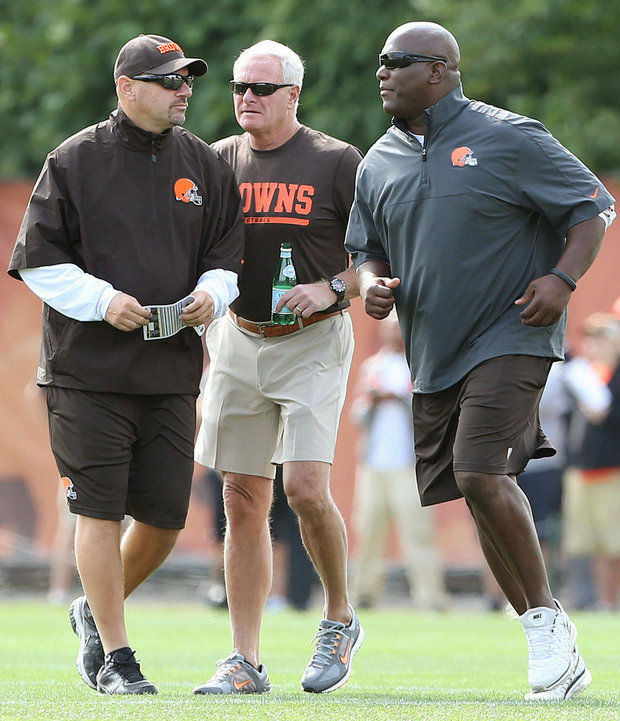 The improvement of the defense in the second year of Pettine’s system. And new uniforms! Can’t forget the uniforms! Seriously, though, there are two points from this that everyone should take away if/when the Browns are selected. First off, the team may have no say in this. We’ve already seen people talking about how this is just another move by team owner Jimmy Haslam to grab some headlines. Because, in case you didn’t realize it, Haslam is a meddling owner who wants to “make a splash” with everything he does. Except, of course, there’s no real evidence of that, but if it fits a preconceived storyline, then people are willing to run with it. If no one volunteers, the NFL will volunteer someone and the Browns are one of 10 teams that meet the league’s criteria: they don’t have a first-year head coach, they haven’t made the playoffs in the past two seasons (ahem), and the Browns have not been on the show in the past 10 years. The second notion we’ve seen floating around is that the producers of Hard Knocks will embarrass the Browns and the city. We’ve never seen an episode of Hard Knocks, but we’re willing to bet that since the league is involved with the show that Commissioner Roger Goodell is not going to allow one of his franchises to be shown in a poor light. No matter how we feel as Browns fans about the possibility of the team being featured, it is really out of the hands of anyone associated with the team. If Goodell wants the Browns, they are going to be on the show. The less said about Liverpool’s 2-1 loss on Sunday at Manchester United the better. The Reds had a chance to extend their unbeaten run in league play to 14 games and overtake Manchester United for fourth place in the Premier League only to come up short in the biggest game of the season so far. The loss was Liverpool’s first since the last time they faced Manchester United, on Dec. 14, and manager Brendan Rodgers is hoping his squad can rally once again with just eight league games remaining. Liverpool never seemed to be in the game after Juan Mata opened the scoring at the 14-minute mark with the first of his two goals on the day. And things took an unexpected turn for the worse just 43 seconds into the second half when Steven Gerrard was shown a red card, leaving Liverpool with the unenviable task of playing catch up while a man down. 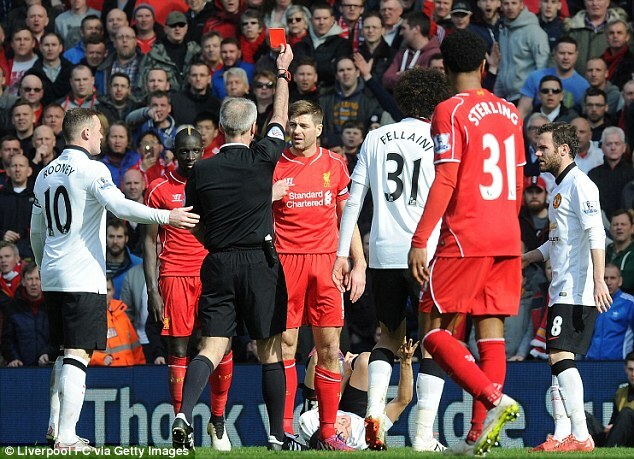 Gerrard faces a three-match ban because of the red card, but as he’s become a part-time in his final days with the club, that may not be the hardship it once was. More pressing is that defender Martin Skrtel is facing his own three-game ban for stepping on Manchester United goalkeeper David de Gea at the end of the match. While Skrtel’s miscue was not as blatant as Gerrard’s, the Football Association is investigating and Liverpool could lose a key defender at a time when they can lease afford it. Throw in that Adam Lallana and Daniel Sturridge both picked up injuries and it was certainly a day to put behind the club. “It makes it difficult (for the top four),” Rodgers admitted after the game. “We had a 10-game objective that we set and built into that was that we were not going to win every single game. It’s still very much (possible) for us to go where we want to go, which is the top four. We thought this was the most ridiculous thing we read today, but then a new contender emerged.